A week ago I wrote up a review about Caseable's customizable cases, particularly their iPad case. I loved mine so much that I'm super excited to tell you guys that I'm giving one away to a lucky reader! 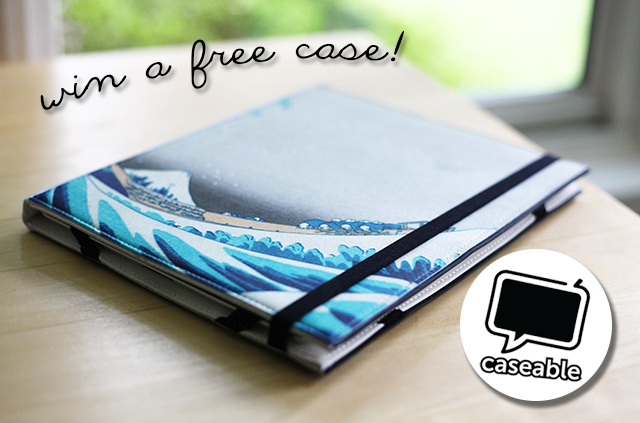 You can upload your own design (or pick from available artwork) and customize a laptop (PC or Mac), Kindle, e-Reader, iPad, or tablet case. I promise, you won't be disappointed. a comment here telling me which case you would pick out! I am just a peasant and not fancy enough for an iPad. But good luck to everyone else! I think I would definitely choose the hill designed cover (the one with a little black colored monster with its arms in the air) for my Google Nexus 7! I would get the colorful zebra print case for my Kindle Fire. Your blog is super cute! I absolutely love your photos - the color of those jeans is gorgeous! Liked the FB Page :o) I'd be getting a case for my MacBook Pro! I would get a Google Nexus 7 case! Liked you on Facebook under MC Chau! Followed you on Twitter under cxc118! I liked the FB page; I'd get a case for my Macbook Pro! I love all of the artist cases! Especially csbl x Gela Behrmann! Your case is so beautiful! It would be an honor to win!